Shishito Peppers with Smoky Paprika Aioli make a tasty appetizer that is pretty much the easiest thing I’ve made lately. It’s fun to put them out in front of a group of people and watch the addiction begin. If you haven’t come across shishito peppers yet, keep your eyes peeled. It shouldn’t be hard to find them, whether at your farmer’s market or at your local Trader Joe’s (I’ve picked them up at both places). They’ve also popped up on the appetizer list at restaurants around the country: I had them in San Francisco about three years ago, and in Phoenix and Cleveland more recently. These peppers are small, and they’re neither overly spicy nor sweet, but rest assured you’ll find at least a few in your batch that are on the spicier side. That’s part of the fun, right? 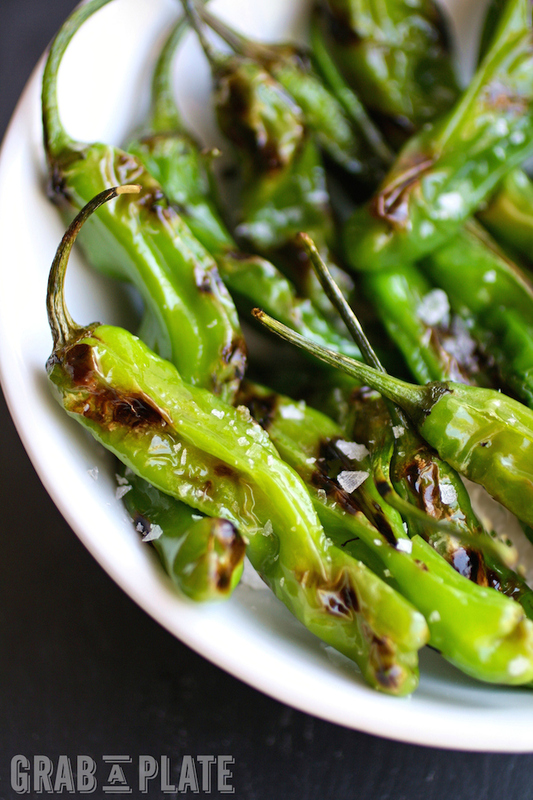 I cooked these peppers on a stovetop grill, but you could also blister them in a skillet. For dipping purposes, I whipped up an easy aioli that includes smoked paprika for extra flavor. You could serve them garnished simply with a bit of sea salt, but I think the aioli takes things over the top. Next time you’re dining out or at the market, keep your eyes open for these babies. 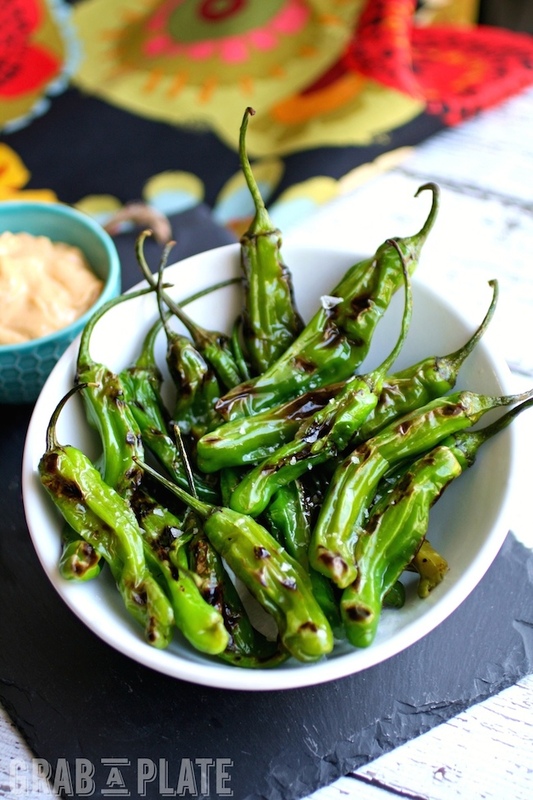 I’ve also seen Padrón peppers on menus at restaurants, and they’re very similar to shishitos. This is a great vegetarian appetizer option, and this is a naturally gluten-free dish, too. Sub out the regular mayonnaise in this recipe for vegan mayonnaise, and you’ve got yourself a vegan treat. 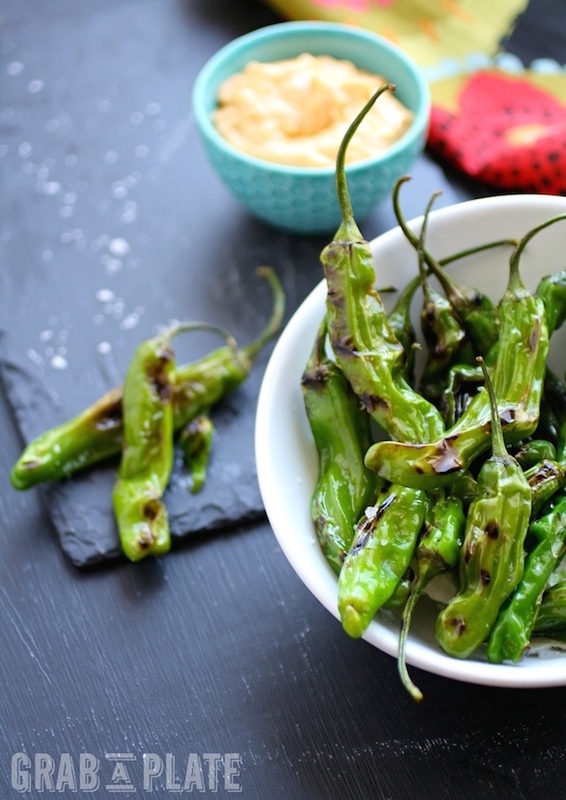 If you’re a pepper lover, you’ll be excited to delight in Blistered Shishito Peppers with Smoky Paprika Aioli. If you’ve never really thought much about it before, these will win you over. Use a knife to cut up the smashed garlic as small as possible. Add the sea salt over the garlic and use the back of a knife to mash and mix it together until a paste forms. Add the mayonnaise to a bowl along with 2 tablespoons of olive oil, the lemon juice, and the garlic paste. Mix to combine. Add the paprika (and remaining 1 tablespoon of olive oil if you think you need it to reach a thinner consistency) and mix again. Taste and adjust the seasoning as needed. Place a grill pan on the stovetop over medium high heat. Add the clean and dry peppers to a bowl and toss with the olive oil. When the grill is hot, add the peppers and cook, turning occasionally, until they begin to blister and char slightly. Remove from the grill and transfer to a serving bowl. Season with the sea salt and serve warm with the aioli. Hey! Yes, they are super hard to put down! I bet you'll start noticing them here & there. Hope you find them and give them a try! This looks like a great healthy snack! We are looking for different and unique munchy snacks, and this seems perfect! Hi Kacey! Hope you give them a try -- they're great with just a bit of sea salt sprinkled on, too! I know I'm going to love this! My favorite tapas while in Barcelona a few years ago was the blistered peppers. I think they were padron peppers? In any event I must give these a try! Pinning it! Hi Judy! Oh, yes! A local restaurant serves padron peppers and they're very similar! Hope you like these! Your pictures are beautiful! I've made shishito peppers before but usually just serve them sprinkled with coarse salt, can't wait to try your aioli! Thanks so much, Sara! They're great with just salt, too! What an interesting and delicious-looking recipe!!! I want to make this STAT! Thanks, Tia! Hope you give them a try! I've not seen these peppers but now I'm going to have to find them. Plus anything that is paired with aioli is a winner in my book! Would love it if you would pop on over and share on Try a Bite Tuesday at Caleigh’s Kitchen! The party is still open until tomorrow! I've recently fallen in love with shishito pepper! We've been popping them like candy here lately just cooked in a bit of sesame oil but this aioli sounds fantastic! I love them and end up ordering them when I'm out! Thanks so much! I've seen shishito peppers on a lot of my favorite restaurant's appetizer menus lately! Need to try these at home, thanks for sharing! Yes! They're popping up all over! They're super easy to make at home! Hi Christin - I know - they really are hard to put down! These look so good and unique... great idea. Oh and I'm Italian too and there was always room for one more plate! Thanks, Sheryl! Let me know if you end up trying them! I will absolutely keep an eye out for Shishito Peppers. The way you prepared them sounds perfect. Thanks so much, Ginny! Hope you find them and enjoy! Patricia, these are simply brilliant! A fast, easy and incredible looking appetizer that would be beautiful on any table. And, I love that every once in a while there is a spicy one! Love and pinned! Hi Kristi! I love that you love the little surprise factor with these ;) Thank you! These look great! I love the aioli. This dish really has a ton of flavor. I just have one question: Are shishitos spicy?I recently made a souther cooking and baking blog. https://kcolescreativecorner.com I would greatly appreciate it if you would check it out! Thanks so much! Hi Kennedy! Thanks so much! No - they're not really spicy, but you might get one or two in the mix that are a *little* on the spicier side. Will check out your site! Love everything about this. I had shishito peppers for the first time about a year ago. Loved them. Just can't find them often. I also love your aoli. Thanks, Peter. If you have a Trader Joe's nearby, try there - that's where I got this batch, but have also found them at farmers markets. Good luck! These look so awesome! I never would have thought to just eat the peppers with the aioli. I have made the peppers and added them to dishes before but not alone! Awesome idea! Spiciness! I'll be honest, I'm a sucker for anything dipped in aioli but these peppers sound amazing! Haha - I'm right there with ya! Thanks, Melanie! When I first moved to Denver I removed peppers from everything. Fast forward and it's the opposite, I can't get enough. These look gorgeous and love the idea of aioli. Hi, Barbara! I've been like that with some things, too (mangos if you can believe it)! Thanks so much!! Very cool! Thanks so much, Brian! What great photos and recipe! Pinned and shared! I have never had Shishito Peppers but they sound delicious! Love the Aioli - what a fabulous dip. I can think of so many things to use it with as well as the peppers! Hi April - yes, I could eat the aioli with pretty much anything ;) The peppers are so tasty! Hope you can find some to try! Thanks for your kind words! Growing up, we always had a side of blistered or mildly sauteed peppers. This is an awesome recipe. What a delight! Thanks so much, Rini! I have a bag of these sitting in my fridge - this is JUST the recipe I need!!! Great timing, Cathy! Hope you enjoy them! Hi Farha! That's exciting - I hope you both enjoy them! Looks delicious! My boyfriend would definetely be a fan of this. Thanks, Brooke! Hope you try them and both enjoy! These peppers! ONe of my absolute favorite appetizers! I can not wait to try them with them with your sauce! I gotta check for those peppers the next time I'm in Trader Joe's! Yes! Keep your eyes peeled! Thanks, Andrea! This looks incredible! I love anything with aioli so I can't want to try this recipe out. Thanks, Alexandra! They're so tasty! Enjoy! Oh I can't wait to try these - right up my alley! Thanks, Allyson! Hope you love them like I do! Mmmm...This yummy tantalizing recipe is perfect for upcoming family gatherings of all types. These beautiful blistered peppers served alongside smoky aioli look spectacular! This flavorful appetizer recipe is a keeper! Thanks very much, Denay! So many people like this dish, so it's perfect for get togethers! They disappear fast! These sound like an addicting appetizer for sure! I'm sure these will disappear fast! Yes! They go fast, for sure! Thanks, Erin! I've never seen this before! The aioli sauce looks really delicious! This is a cool thing to try for a party appetizer. Thanks, Deborah! Definitely fun for a party or get together! Thanks, Diane! I hope you get to try them, and enjoy! 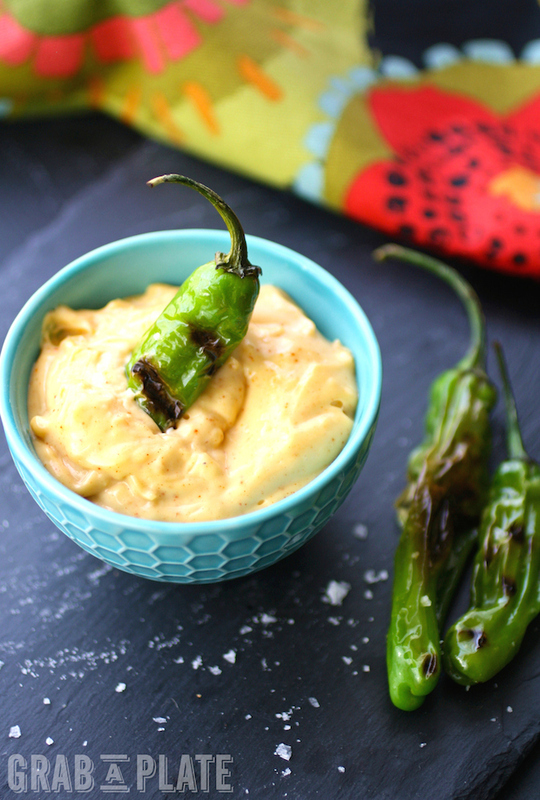 I love the idea of smoky paprika aioli! Right? Super easy to make! Thanks, Nicole! Now this is my idea of an amazing snack! Cannot wait to try that aioli! Shishito peppers are my favorite! I have no shame in saying I just went to 3 supermarkets looking for them. Finally found them and bought a pound for myself!!! This smoked paprika aoli sounds like an absolutely perfect match- I am so excited to try it out! Thank you! Also wondering.... If I use regular paprika in lieu of smoked, will I be missing out on a lot of flavor? Hi Dakota! Isn't it funny how we become a little obsessed?! I don't think you'll miss out on tooooo much flavor with regular paprika (maybe a bit). Maybe you could add another ingredient you have on hand (like a smokey hot sauce)? The peppers and dip are so good! Thank you, Alane! One of my favorite snacks! This an excellent aioli for the shishito peppers!! So glad I found this recipe! My guests love it!! Alane you scored a home-run with this recipe!! Thank you!! Patricia, thank you! I made this exactly as recipe states and it was delicious. It has wonderful flavors. Five stars for this peppers. That's great to hear, Kate! Thanks for letting me know, and I'm so glad you enjoyed it!